With the Pro Viewer BinoCam, you’ll always take a crystal-clear shot - no matter how far away the action is! The BinoCam gets you eight times closer to the action, so you will have no difficulty capturing you favorite football receiver make an electrifying catch in the end zone, your favorite baseball star knocking one out of the park, your favorite hoopster burying that 17-footer at the buzzer. Then you’ll view the images on a 1.5-inch full-color LCS screen. But it gets better! This product has been upgraded to include 5.0 megapixels. Also, the BinoCam takes AVI video clips, so you can capture the action, then come home and relive the moment on you computer screen. So take it to the beach and watch the surfers ride the perfect wave. Bring it to the mountains as the skiers swoosh down the hill. Prove to your friends you spotted whales on that last boat trip. Assist the police by snapping the license plate of that vehicle. 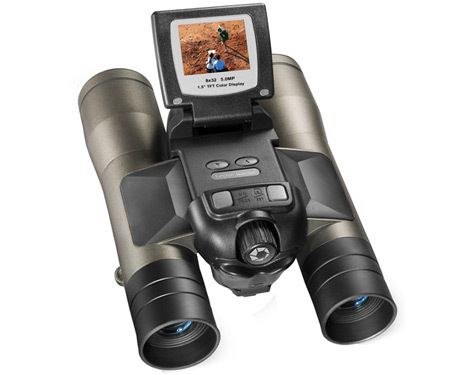 The BinoCam combines powerful binoculars, a high-resolution camera and a camcorder in one. It’s all you need to catch the action.